Nurtured by nature and handcrafted in the USA. Our wooden bowls are finished with our famous Bee’s Oil Wood Preserver and ready to fill with your favorite salads, fruits – even popcorn! Use Bee’s Oil or food-safe mineral oil only. These oils penetrate natural wood surfaces and protect against drying, splitting and cracking. Rub Bee’s Oil or mineral oil inside and out with a soft cloth, once a month or if wood looks and feels dry. Never use vegetable oil, which can turn rancid. Wash with soap and warm water, rinse and dry immediately. 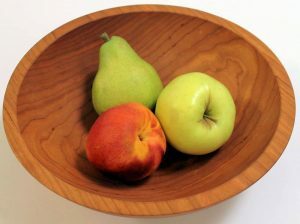 Do not allow your wooden bowl to soak in water. Never put wooden bowls in the dishwasher. All Holland Bowl Mill bowls come with a lifetime guarantee. If your bowl ever cracks or warps from regular use, Holland Bowl Mill will replace it with a new one of similar size and finish. Never let water stand in a wood bowl for a long period. Also, please do not place any wood product in the dishwasher. Holland Bowl Mill recommends using water and a small amount of mild soap to wash your wood products, then hand dry.